Blog Note: Another public sector employee has been fired for posting disparaging remarks about their employer. Is it a freedom of speech vs. employee conduct issue? Well, we did our ice rescue training a few weekends ago. It was the usual rehash of what we do and say every year, a good refresher for everyone before the annual ice fishing derby the next weekend so we are ready with the know how fresh in our heads. Edit Note: I wrote that "protesters are getting doctors' notes". It should have said "teachers". I apologize for the error. In addition, the Taft-Hartley Act outlawed the closed shop in 1947, but allowed for union shops. The errors have been corrected. It is in sadness and with great honor that we as a Brotherhood post a Line Of Duty Death for 2011 from the USFA. 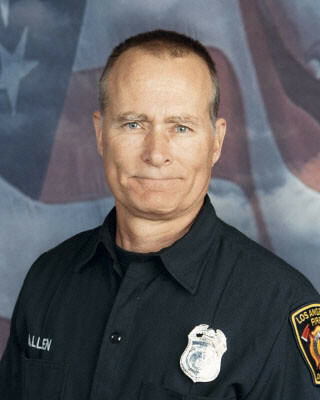 Fellow Brother Firefighter?Paramedic Glenn L. Allen has made the ultimate sacrifice in love for their fellow man. Our sincerest condolences go out to his family and the members of the City of Los Angeles Fire Department. I never liked this Presidents' Day idea I always thought it was lame. There are presidents who deserve to have their own day, a day when we reflect on their legacy and their contributions to our nation. Men like George Washington, Abraham Lincoln, Calvin Coolidge, JFK, and many others but to lump them all together is probably politically correct although highly disingenuous. For those who don't know yet, Fire Apparatus & Emergency Equipment is now part of the Fire Engineering family. I am pleased to introduce myself as Associate Editor Chris Mc Loone. You would have to be living in a very deep h*** not to have noticed the vicious pro vs anti-union rhetoric being slung by everyone from politicians to the old lady walking her dog down the block.This is a nasty and dirty line being drawn in the sand, and one that my state of Ohio will face shortly (if not already with SB-5). It is in sadness and with great honor that we as a Brotherhood post a Line Of Duty Death for 2011 from the USFA. Fellow Brother Firefighter Larry Gressett, Sr. has made the ultimate sacrifice in love for their fellow man. Our sincerest condolences go out to his family and the members of the Toomsuba Volunteer Fire Department. It is in sadness and with great honor that we as a Brotherhood post a Line Of Duty Death for 2011 from the USFA. Fellow Brother Firefighter Thomas V. Regan has made the ultimate sacrifice in love for their fellow man. Our sincerest condolences go out to his family and the members of the Garden City Park Fire Department. HOLLYWOOD HILLS (KTLA) -- Fire officials say one of their own has died from injuries suffered while battle a huge fire at a home in the Hollywood Hills early Thursday morning. 38-year veteran Glenn L. Allen died at 12:15 p.m. Friday, said Erik Scott of the Los Angeles Fire Department. It is in sadness and with great honor that we as a Brotherhood post a Line Of Duty Death for 2011 from the USFA. Fellow Brother Firefighter/Forest Ranger Technician Donald R. Lam has made the ultimate sacrifice in love for their fellow man. Our sincerest condolences go out to his family and the members of the Kentucky Division of Forestry. With the mid-term elections behind us, we now need to look forward. With a nation concerned about the economy and our growing deficit that was created by out-of-control spending, it should come as no surprise that spending cuts are a reality that we must face. As a push to limit federal government begins to kick in, I believe that less federal money will be made available to local government and in particular; local fire service. Too Late to stop, Too early to quit! Too late to stop, too early to quit.